China's TV broadcasting regulator has announced that foreign TV shows will no longer be aired during prime time, state media report. The State Administration of Radio, Film and Television (SARFT) says these shows cannot be aired from 19:30 to 22:00. The series also cannot run longer than 50 episodes and should comprise "no more than 25% of programming each day". According to the China Daily newspaper, the "aim is to improve the quality of imported TV programmes". Local TV channels are not allowed to show too many shows from one particular region, the regulator says, without explaining further. Foreign shows also have to be approved before they are aired and cannot have violent or vulgar content. Stations that violate the new rules face "severe punishments", the newspaper reports. 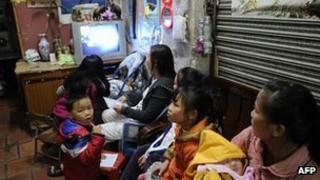 Most foreign TV shows broadcast in China are from Hong Kong, Taiwan, South Korea and Thailand. The move comes after President Hu Jintao told members of the Communist Party last month that officials should remain vigilant against Western cultural influences. The new rules follow a series of new regulations on TV programming. In November, China ordered a ban on advertisements during TV dramas as part of its reform of cultural activities. It also clamped down on light entertainment shows, limiting the number satellite channels were allowed to show. Officials also told a successful commercial station to stop broadcasting a popular talent contest called Super Girl. They said it was too long, but others suspected the show's huge popularity was a reason. The move comes at a time when the Communist Party is seen as trying to get a firmer grip on Chinese culture. In a Central Committee meeting last year, China's senior leaders appeared to indicate they wanted to keep an even closer eye on broadcasters.